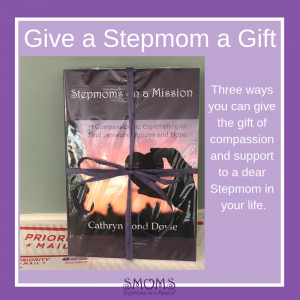 Stepmoms wrote in, Cathryn replied​. How can we handle the fact that my Stepkids’ bio-mom tells them inaccurate or inappropriate facts about their dad/my DH? Jealous of sister-in-law and my step kids. What can I do? How do I stop SD from lying to me, DH, BM, and BM’s boyfriend? Trouble coping w/BF’s newborn and his ex-spouse. Bio-mom is online stalking and has issues w/ pictures of stepkids. When BM causes drama, how to preserve my relationship w/ stepkids? How do I change my attitude towards my new inherited family? A bio-mom worried about her daughter’s new Stepmom. Will we help? Dealing w/ unkind stepkids, ex-wife, MIL costing me my relationship? How to deal with a lying stepdaughter, her bio-mom & ex-Stepmom? What boundaries do I need to set with husband and stepdaughter? I feel jealous of my partner’s ex & unheard by my partner. I want my bed back! Help with situation that dad, bio mom & step kids all agree on but not me! I think the problem is my partner. Why is he fighting my efforts? Husband still has divorce guilt and his kids are in their 30’s–ugh! How do I cope w/DH’s need for perfect family? I’m more realistic. Partner sets no Boundaries for step daughter, 20 – what to do? My partner with 3 bio-kids is not trying to bond with my 2 kids. My partner doesn’t understand why my feelings are hurt. No matter what I do, bio-mom still hostile. I feel hopeless and scared. What to do when bio-mom turns my stepdaughter against me? Bio-mom is badmouthing me to my stepson & he tells me and my kids. How to deal with bio moms return after long absence. Bio-mom doesn’t want me present at any of my stepkids school events. How to handle bio-mom who keeps asking for more money? Bio-mom used me, I drew a line, she’s angry — now what? Bio-mom doesn’t want her kids, then does-what’s going on? Bio-mom back & I’m hurt by her impact – what can I do? Bio-mom assaulted me & told step kids it was the other way around. How to accept bio-mom’s “bad” choices? When bio-mom sends stuff from life with your partner – what to do? Invested so much love, time, energy & money…seems it’s never enough. How to let go of the single life versus being Stepmom? Self-Pity-an emotional numbing, energy draining tactic-find a new option. Why am I so jealous? What about my irrational fears? Feeling like the enemy in my own house. Yes I have a teen stepdaughter. Are you in the mood for Stepmom’s Pep Talk – read this! Feeling like invisible parent to stepson- help! Holiday traditions? Some ideas from sister SMOMS. Right now, I HATE being a Stepmom!!! From BB: Self-awareness can hurt…why is that? How to step back in after stepping out? Do I love my stepson? Sometimes I don’t know. It’s too much work- I need help from my partner & Family! Don’t know where I went wrong. Please help me! About to become a stepparent and am terrified! About ready to throw in the towel! How can I find the right balance & boundaries? When to call it quits? What to do? How do I deal with all the hurt and anger? Why don’t I matter in this stepfamily? Clarifying Mission Statement for SMOMS. What about the rage! I “Lost it” last night. Help! I love my partner, but I also wish his daughter didn’t exist! How to make the transition between homes easier for stepkids? How do I handle my feelings when my stepchild stops saying I love you? Feeling resentment towards my stepson and can’t connect with him. I am frustrated with my stepkids 99% of the time…help! How do I deal with a bio-mom who doesn’t want to get along with me? When your stepkids are away on Christmas Day. My husband stays at his mothers when he has his daughter for the night. My 3 yr old stepson seems to be crying all the time! How can I handle my stepdaughter (8) who loves negative attention? I want a better relationship w/ teen stepson. Why does my stepson idolize his bio-mom? I have issues with my teenage stepdaughter and the car…Ugh! How do I help her understand chores/rules don’t mean that I don’t love her? Why does my stepson’s rudeness bother me so much? I’m at the end of my tether… Stepchildren don’t seem to like me. Why do things my stepkids say bother me so much? How to help my stepson, when his mom encourages him to lie to us? It feels like my 5-year old stepson throws his mom in my face! Help! I have two step kids I can’t control. Just jealous or maybe time to leave? My stepdaughter chooses her bio-mom for school play-it upsets me. My stepkids don’t recognize how much their dad does for them. What to do about disrespectful 20 yr/old stepson? Looking for some Free Advice from Cathryn?